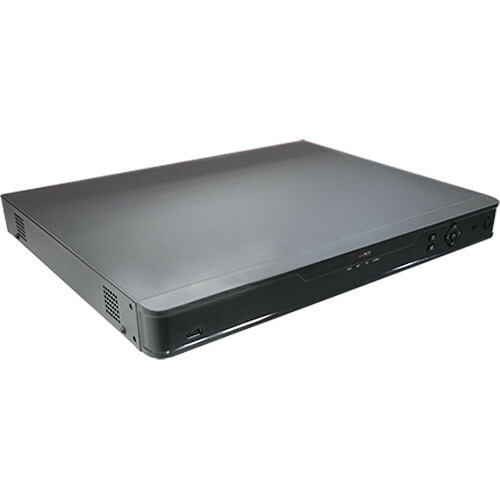 Stream and record up to 32 channels of video with this ACTi Standalone NVR at resolutions up to 12MP. Equipped with four SATA ports, each supporting an HDD up to 8TB, the NVR can be configured with up to 32TB of internal storage (HDDs available separately). External storage options include Windows PCs via internet connection, network servers, and USB storage devices. Network bandwidth is optimized while ensuring high-quality recording and playback using H.265 and H.264 dual-streaming compression. The NVR enables simultaneous live view and playback of up to 16 channels at resolutions up to 12MP via one VGA and two HDMI ports. Up to 32 channels can be recorded simultaneously, with a maximum combined throughput of 320 Mb/s. Number of Remote Users Supported 128 max.